You must make reservations at least 5 minutes in advance of the time at Cantina Laredo - King of Prussia. 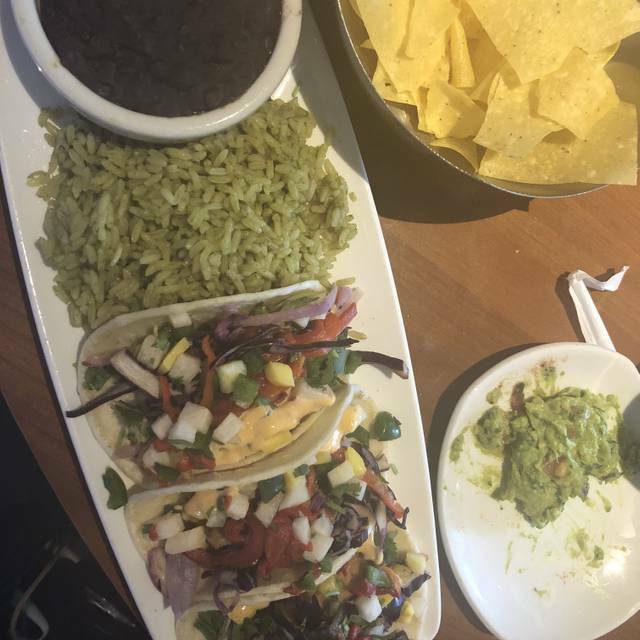 Cantina Laredo serves authentic Mexican dishes in a sophisticated atmosphere. We offer daily fish specials, grilled chicken and steaks complimented by signature sauces such as chipotle-wine with portobello mushrooms or sauteéd artichoke hearts and roasted red bell peppers. Monterey Jack, green onions and tomato. Braised pork shanks with smoky chipotle wine sauce. Charred street corn and black beans. On a bed of caramelized onion and bell peppers. Garnished with roasted red pepper and cilantro. Served with guacamole, sour cream, pico de gallo, rice, beans and fresh flour tortillas. ^ SIGNATURE DISH. Ask about our GLUTEN-FREE versions. Steak, eggs & seafood are available cooked to order and may be served undercooked. Ceviche is served raw. Please direct any food allergy concerns to the manager prior to placing your order. Overall ok. The steak in the burrito and tacos was fatty and chewy. My party did not want it to be sent back as they have had a bad experience in the past with food sent back. Usually good food. Tonight not so much. Delicious as always and the service was great. Our server recommended some dishes to try and they were delicious. We were disappointed. The place was not crowded, yet we had to sit in a booth near everyone else, by the bar. It was really loud. It took forever for our waitress to show up. We specifically chose to go there because we were all wanting guacamole. After waiting forever to order, our waitress said it wasn’t available. No explanation, no “sorry”, nothing. When our food came, we didn’t see our waitress again until we were completely done. We wanted more to drink and my daughter needed something to go with her dinner. We won’t be back! The appetizers and Mahi Mahi tacos were great. My wife said the beef fajita burrito was Ok. The service was good and the atmosphere was descent. Nothing wrong. Food and service were good, just not great. But we would go back. We were seated and it took quite a while for our server to come over. She was very nice but also very scarce throughout the meal. WE have eaten at this restaurant a number of times and have never had this issue. Disappointing. Second time there. First time was better. Don't expect to go back anytime soon. A friend and I had lunch and we both enjoyed our meals. I ordered the espinaca and it was very good. Chips and a bean dip were served as we waited for our food. The waitress was friendly and knowledgeable about the menu. The interior is bright and pleasant. Great food and service. Lovely choice for yummy Mexican food at k of p mall. 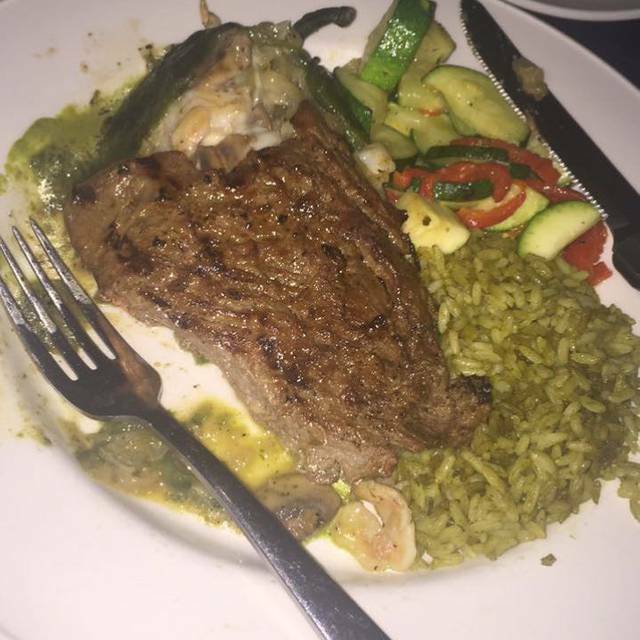 Lots of wonderful choices, definitely a step above your average Food Chain Mexican restaurant! Great flavors!!! The salad I had was very fresh. The guacamole was made in front of you and be customized. Awful - will never go back. I ordered the chicken tacos and they were inedible. The chicken tasted like mushrooms and was a worse quality than what you’d find on a prepackaged chicken Cesar salad at the airport. The cucumber margarita was all sour mix. So, so disappointing. Tamales has been removed from menu which is sad. Birthday cake has nuts and my son is allergic. Disappointed when hostess tried to seat us in a tiny table right next to the bathrooms, which we refused. Service was basically good. I like the ambience. Salsa with chips were delicious. However, we ordered the poblano green enchiladas and they were barely warm, and had little to no flavor. Just plain, dry chicken as the filling. I would try rhe restaurant again, however, but please ask your chef to learn hoq to make an aurhentic enchilada. Everything was excellent, the food, drinks, and service. Will be back for sure! Best guacamole & refried beans! Our meal was excellent. Pricier than most of the other Mexican restaurants in the area but the menu was original, the drinks excellent and the table side guacamole awesome. I will definitely be back. Good food that arrived quickly, though the service was slow to arrive and slow to come back to take the order. This was not a busy night. Our waitress disappeared. The manager wound up waiting on our table, and he was excellent, but it took almost a half hour for him to get to us. The food was not authentic, the Mexican corn was canned corn. At King of Prussia this will be the only place with an open reservation when all the others are full...there is a reason why. I find the selections at Laredo to be very tasty and just the right proportions. I’ve been impressed with the quality every time. Drinks were good, service was great and food was delicious. our drinks. We finally got up and had the bartender give us water and Diet Coke. She left the check on a fly by and didn’t even ask if we wasn’t Ed anything else. This was probably our last visit. Food was fantastic. Service was OK.
We were seated at the table and waited 30 mins (after asking twice) but still no service. We walked out. Pathetic. The appetizer arrived at the same time as the entree. Both were good but would have been better served separately. Christine did good job taking care of us. Overall, service was lackluster. Nachos and tamales were not up to standard. We come often and will be back again soon. Cantina has had a very good happy hour, and the food has been very good. The service the last couple of visits has Ben extremely poor. Out table went for 45 minutes without our server checking on us. When I finally got up and asked the hostess to send someone to our table, no one came again for another 15 minutes. Finally after I went to her again and asked to speak with a manager, a different server came after about 5 additional minutes...and the manager never came. It was very clear that this restaurant has very poor staff planning and organization. Service was unattentive and slow. Food was mediocre. Great place! I highly recommend for a business lunch, happy hour or romantic dinner. It is nice place with good food. I’ve dined here at least half a dozen times. I generally have had very good experiences for a quick lunch while shopping at the mall. My most recent experience was a little disappointing though. Service was slow, the side dishes were room temperature and the skirt steak tasted as if it had been cooked a while back and then microwaved. This was a big departure from my prior visits where everything tasted freshly prepared and came out sizzling hot.